Everyone knows about SETI, the search for extra-terrestrial intelligence. There is a whole network of radio telescopes pointed at the sky, recording all the signals the antennas pick up, using computers to shift through the noise to see if maybe there’s some signal that indicates an alien intelligence in the galaxy. Just like the movie Contact. Who knows if we’ll ever find another intelligence in space, but of course that possibility is worth paying attention to. But while finding evidence of alien intelligence out there is unpredictable, I believe it is almost certain we will meet alien intelligences here on earth. These minds will be “machine” intelligences, and thus by definition, alien to us. 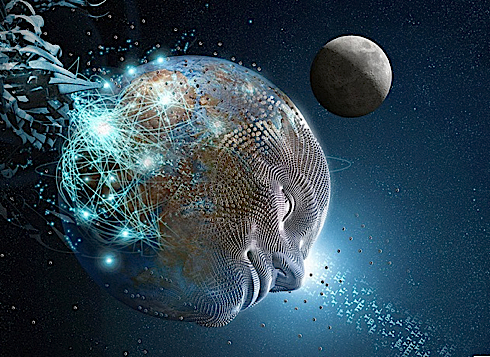 One of these machine intelligences may be a global one — a mind that exists in the membrane of electronic communications around the planet. Many thinkers, starting hundreds of years ago, have imagined our collective societies forming a planetary mind of some sort. In popular culture, the internet gets smart and takes over. (In fact, according to the Terminator movie series, Skynet went live today, April 19, 2011.) Until recently this has mostly been metaphor. But as our global telecommunications continue to proliferate at an accelerating rate, it seems plausible that the metaphor might be real. I did a back-of-the-envelope calculation a few years ago to show that, to a first approximation, the total complexity of the link “synapses” and the “neuronal” transistors in the global web equals the complexity of synapses and neurons in the human brain. But complexity alone does not a mind make. Although the internet is a colossal, networked machine with the apparent complexity of the human brain, this does not necessitate that it possesses intelligence or awareness. It may well only have the properties of a mega-toaster, which is to say an enormous algorithmic process that remains, simply, a machine with no surprises and no interesting emergent properties. Just because we have networks of links and electronic transistors in the multi-billions does not mean that it is possible to program such a network to think. It’s even more improbable that an intelligence would simply emerge, or self-organize, on its own from such an adhoc mess. And so quickly. On the other hand, what if? What if the global noosphere did generate some small measure of emergent intelligence, how would we know? We won’t know that there is something beyond the mega-toaster scenario unless we search for it. Its presence is an unlikely long shot at this moment, but so is detecting extraterrestrial alien intelligence. In both cases, despite low chances, we need to find out. Nor does the search have to find a full fledged mind to succeed. With SETI we may discover a fascinating alien life form that operates at the level of snails rather than clever, stun-gun-wielding extraterrestrial civilizations. Similarly, instead of skynet we may discover something more like small insect-like cognitive gestures, the first whisper of emergent properties. That’s still a new continent! We find ourselves at a unique moment in history, one in which there appears to be a gargantuan new organism available for study, and we are the first generation to spot it. Like naturalists discovering the platypus, we have a chance to be physiologists of the net. We can use electrodes, pattern recognition, and the tools of the net itself to understand the critter that has wrapped itself around our planet. The problem is, we really have no idea how to detect such a global AI with these tools. It turns out that SETI is not really looking for any signs of intelligence. It is primarily seeking anomalous, non-random signals of any sort. The kind that would stand out against a background of repetitious and random noise. You might say it is looking any signs of life, intelligent or not. In fact despite their name, SETI says in their mission statement that the organization “seeks evidence of life in the universe by looking for some signature of its technology.” When scanning the inert cosmos, any disequilibrial and life-like pattern is extraordinary, and big news. But because the internet carries humanity’s messages, life-like signals are the norm. 1) Filtering out the ordinary massive background signals of human intelligence. 2) Defining what intelligence is, so we know when we find it. Of the two, the second is much more difficult. And we can’t really solve the first unless we solve the second. Intelligence may be the wrong term, or a very distracting term. For some reason we are only able to imagine human-like intelligence. We tend to describe an animal intelligence in the degrees to which it is like, or not like, human intelligence. But we shouldn’t restrict our ken to the kinds of intelligence we’re used to seeing in human or animal species because a net intelligence would be a very un-animal quality. After all, the net has no direct need to reproduce or to fight for energy resources as every animal does. And it has not been carved into shape by eons of ancestors who have fought pitilessly for survival. There’s no reason why an instinct to survive would be a necessary condition for an intelligent system. All intelligent biocreatures seem to have this drive, but of course this is only because we never get to see those species that did not. For all we know, an intelligent internet might want to be turned off, or be entirely neutral to the idea of ending. For these reasons, the search for resource-gathering might also not be a key sign. At the heart of all skynet scenarios is the assumption that hunger and survival are key elements to the net’s behavior; this assumption, unsupported as it is by the net’s evolutionary history, might miss the target. And if the net does has emergent survival properties, they may be difficult for us to recognize. If we ignore the adjective and focus on the noun, our search ranges from looking for evidence of a organism, to thoughts, to intelligence to consciousness. Perhaps our search should be a consecutive search, first finding a global superorganism, then a global intelligence, then a global consciousness? SETI solved this problem of definition by simply focusing on anomalies. Maybe we should call our objective the Search for Internet Anomalies? While that gives a lot of latitude in what to look for, it is not aiming high enough: after all we are not just seeking mysteries, but intelligence. But looking for anomalies in signals is a fair place to begin the search. It is unlikely that any kind of search at the present time will find an internet intelligence, but it is very likely that this off-beat quest will produce useful benefits in other fields. First, pushing towards a useable definition of intelligence can be useful for general cognitive studies. Similarly, specifying evidence for an internet intelligence will continue, and perhaps extend, the long arguments about the nature of artificial minds. Finally, the tools necessary for combing the internet for telltale signals of mindfulness could produce useful innovations in global telecommunications. This is more than just a passing fantasy. I’d like to take the idea of an Internet Intelligence seriously. I am looking for collaborators interested hammering out a research path, guidelines for defining the scientific aspects, and those with technical skills to create real tools. A formal definition of Machine Intelligence now exists.